Kuthiraivali or Barnyard Millet is a nutritious millet rich in fiber, vitamin B, proteins and other essential nutritients. 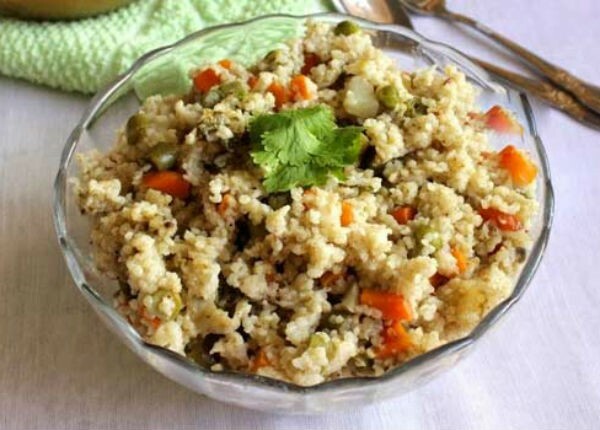 This khichadi made with barnyard millet is ideal for breakfast or lunch. To a pressure cooker, heat oil in medium flame. Saute the ingredients given for tempering. Add the green chillies, onion, ginger garlic paste and cook till the raw smell disappears. Add the tomato, chopped vegetables and needed salt. Add the soaked rice and pour 2 cups of water to it. Pressure cook until 2 whistles. Wait till the pressure has reduced. Add the ghee to this kichadi and mix well. Feel free to comment or share your thoughts on this Kuthiraivali Kichadi (Barnyard Millet Kichadi) Recipe from Awesome Cuisine.